As reader Arteopteryx noted last page, the processor is indeed in the shape of a Minor (a major Minor). Default setting, though the form the processor can take is somewhat fluid. Mare Internum won a bunch of nice mentions via the Excellence In Webcomics award, which is awesome! If you’d like, you can nominate the comic for their People’s Choice award as well. Also we had a quick and dramatic earthquake where I live at 240 am, jolting much of the area awake and onto Twitter to yell at each other; in case any of my readers are from the Bay Area I just wanted to make a :[______]!!! face at you in solidarity, haha. Mysterious Water God Being: That’s because you’re a sourpuss, Mike. If anyone asked me for one page that would tell them what they needed about the comic to convince them to read it, this would be the page. Then they’d be entranced before being blindsided by the slow but steady steamroller of feels (The Feelsroller), like Der-Shing intended. (sempai noticed meee :D) Was “somewhat fluid” a word-play? I’ve been trying to figure out what a “minor” morph wolleria female means and google isn’t helping… what does it mean? The water looks like something but idk what…. There are three Wollerian genders, two of which can reproduce (“female”) and are called Majors (like Kalla) and Minors. Minors are generally considered to be more intelligent and of a higher social value. oh, OHHHH!! I got it now. It does look similar to Kalla I see it now…. and wow there is lore in this comic that I was not aware really should ketch up on before re-reading…. Why was Kalla, as a major, chosen as the one to remain in Mare? On another note now that we’re heading towards the climax I’m trying to figure out where this is going thematically. In the first few chapters I figured it was an analogy of living with mental illness (or any long term illness really). A man trapped inside an biological machine that seems to be malfunctioning. But the focus on Bex seems to wreck that theory. The biggest similarity between Bex and Mike so far is that they have a tendency to push their family members away. And there’s definitely a push pull between loneliness and finding connection. On another note I kinda try to do this with all stories I like, probably a tad odd to do this is a forum where the author reads it but… ah well. There’s no reason why it can’t mean one thing for Mike and another for Bex. I reeeeeeeeally like your interpretation for Mike’s story, by the way. I’ve been wondering about loneliness/self-isolation/connection/vulnerability too, those seem to be major themes for both Mike & Bex, but maybe also Kalla? Especially intro to Bex was getting killed and eaten, the dangers of connection seem pretty literal there. So I’m wondering at the processor communicating with both l language and gesture, and claiming to know Bex; send to me like it’s claiming to hold the answer to every character’s loneliness/silence, while being benevolent? 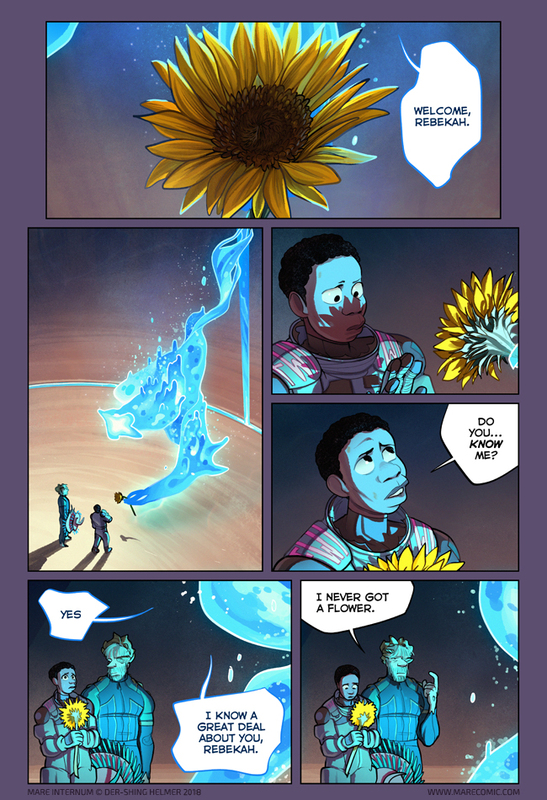 … where the hell did it get that sunflower? She probably had some leftover birdseed in a pocket or something. It can manufacture entire life forms from a whole cloth – I imagine a blob of matter in the shape of a sunflower would be easy for such an entity. I wouldn’t be surprised if it was able to just make it from scratch with the available molecules in the system. I’m intrigued by the choice of a sunflower, here. Sunflowers are a sort of a multi-part organism in a way…Not so much like a jellyfish, but because the sunflower is actually made of hundreds to thousands of individual tiny flowers (florets), each of which serves different purposes. The dark central flowers produces the seeds, while the flowers along the edges produce petals to attract pollinating insects. This strikes me as being very, very relevant to the inner sea and the processor… Even if it contains myriad sub-organisms, in order for the ecology to function correctly everything has to balance out, everything has to do its part. Mike has sort of been accepted into the ecosystem and actively bound to pieces of it, while Bex has consistently fought, destroyed, and resisted being a part of it. There’s also possibly some further personal symbolism which could be drawn out of their behaviors. Mike suborns himself to external demands to the point of external abuse and self-destruction, while Bex has resisted external (familial, social) pressures to become independent. …Or maybe Shing just really likes sunflowers, but with the use of coral-like structures here and there (including Thighfriend, who looks a lot like a zooanthid)(corals being another colony organism), I’m more inclined to bet that it’s deliberate. I just wanted to say this was a really lovely thought-out comment and it made me ponder! If its on purpose that is quite cool, and if not it is still a really cool coincidence. Today I learned about sunflowers :) Thanks! Mike, you ARE the flower. I want a flower too. A daisy, I think. Sunflower! Not a magic wand, but I was close! So where are Bexie-Boo’s growing Facefriends? She hasn’t been, uh, infected? She’s been avoiding the glowy water and killing the thingies trying to get in contact with her. Yeah, but she had spots on her face before that. Starting about when she woke up in the cave with Kalla, if I’m correct? Sorry Joel, just commenting because I forgot them and am reuploading the page and because I don’t want future readers to read your comment and think you’ve got selective blindness. I’ve put Mare Internum on at least my last two Hugo nomination ballots, and will certainly be doing so again this year, so there’s that. Dude… your face is a flower. You got mushrooms, close enough, Michael. I’m tripping out over the passage of time here… like I know it can’t have been months because their hair would be really long otherwise but… comparing their faces to the first chapter, they look so much older! (or maybe they’re just tired lol). Or it’s just natural art evolution over the course of three years who knows. Another chronology question I keep mulling over: The people at Devotion should have become aware of their disappearance after no more than 4 hours. Less, if they tried to check in with them sometime during the afternoon via radio. Much less, if they have sensors or webcams which recorded the cave-in. It’s possible to explain a long time-frame in the Mare if Bex and Mike were ‘resetted’ by the processor, maybe multiple times. But if they have been down there days, weeks or months – what have the crew on the surface done? Had one look at the hole and declared them dead? Or is the “self-sealing mechanism” Levi mentioned able to cope even with such a huge breach? They were probably immediately aware but honestly, what could 3 people do to help? Even if they called for help it’s not like they could necessarily do anything, get an earth mover into the hole, etc. In my head they probably tried to get a signal from their comms and weren’t able to, and closed off the area due to instability. Ah thanks, I see. And the self-sealing-thing sounds intriguing. Regarding chronology: I still think it’s possible that the events that we’ve seen have occurred a long since the cave-in. This might not be the first time around for Bex and Mike. Devotion would have mobilised to the location, assessed the situation as they saw it, and decided against sending further personnel into an unstable cave system. That’s how it works. What will come after MI? Will you concentrate on the “Meek”, or do you need the twofold-challenge? Beautiful lighting, panel 3 especially. Will there be a print run of MI? Yep! Right now I’m aiming for a March campaign. I like the pacing of these chapter starts! Michael Fisher has is priorities straight. Mike, you have a flower, of sorts. It’s attached to your thigh, and it’s your friend. P.S. I can’t believe I’ve been following this webcomic for THREE YEARS! Seriously, how is that even possible? I’d really like to see the logical progression of how Mike turned. Yes, Mike hated people, but he wanted to get OUT of the inner sea. He would rather be in charge of his own life, regardless of what people told him. Even if escaping means facing them all again. Now, Mike still hates people, but he’s been convinced to STAY. He seems to have “bought-in” into the promise of paradise in the internal sea. The irony, in my eyes, is: it seems that life in the inner sea is defined and determined (within parameters) for you. We start a story with Mike rejecting life and the presence of others. Then he holds onto life, long enough, to fuel the determination of escaping; rejecting the inner sea and what it offers. Now he’s convinced that staying here is better for him. Amongst all this, when and where did we lose “Mike”? Where did Mike “die”? I’m a big believer of “less is more” narrative approach; letting imagination fill the gaps, to give the audience a grander fiction with less words. However, I feel, personally, that this needs addressing. The logical turn needs to be shown to me, even if it is slight or in-passing. This Processor better have had one hell of an argument. +1 to this, I too want some reasoning from Mike as to why he decided that staying in the crazy place was what he wanted to do and that he was ok with slowly turning into an alien. It took a heck of a long time to say “Welcome!” to Rebekah, that’s all I can say. Is it really necessary to knock the socks off a person before you decide that you are ready to greet her? And honestly, I would have preferred a sandwich. No, not a Kalla-wich, something appropriate, but . . . Happy anniversary Dershing!! 3 years, wow!! This page is beautiful and hilarious. Forgot to mention. Does it know her though? Does it *really*? It didn’t know her Bex nickname. I really can’t get over the lighting in this page, truly beautiful!! The little details like the shadow of the sunflower on Bex’s face is probably my favorite thing. Did you use multiple opacity and masking layers to give it a more glowing effect in the water? Or just normal layers and playing with the light levels? Yeah, that’s how first contact should be. You give them something nice and symbolic. And then hope like hell the germs on it will kill them. Apart from anything else, this reveals that the processor (and by definition the Wollaria who built it) can manipulate gravity to an extent. Which shouldn’t be surprising, as they’ve built a System that’s apparently worked flawlessly for about four billion years.